As with most other azaleas this one prefers well-drained, humus-rich soil. 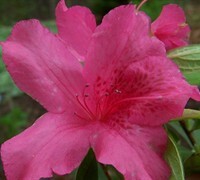 It will tolerate full sun but, like most other azaleas, will appreciate some shade during the hottest part of the day. Judge Solomon Azalea is most useful as a natural hedge or in small to large groupings in landscape beds. Performs exceptionally well under tall pine trees. The Judge Solomon Azalea is one of the best of the sun and heat-tolerant evergreen Southern India Azaleas. Grows more rapidly than other types of azaleas to 8' tall with an equal spread. In spring, large, bright pink flowers nearly cover the foliage. Judge Solomon Azalea is most useful as a natural hedge or in small to large groupings in landscape beds. Performs exceptionally well under tall pine trees. Also useful in home foundation plantings, espalier (grown flat against a wall), or "limbed up" to be a small tree for containers or garden beds. Azaleas prefer a well draining, moist and acidic soil rich in organic matter. As one of the Southern Indica Azaleas, Judge Solomon will tolerate full sun to part shade. That being said, some dappled sun or shade during the hottest part of summer afternoons would be appreciated. Gorgeous plant! It's a great addition to my Azalea collection and looks beautiful in my garden!